This run is a commonly run hike-up section of river. A classic for the class IV community on the plateau. It holds water well and doesn’t take a whole lot to get running. It is also the paddle out of Henderson Creek. Because of that, I never personally prioritized getting this lower section of the river. I always knew that I wanted to get Henderson which was described as a classic to me, so I figured I would get this section at that time. Finally, after 3 years, I was able to get Henderson and therefore also got Richland. Flow was on the higher side… 1.25’ at the take-out which means that there are a lot of fluffy holes to punch. Though apparently the main hole in Timber Rattler is easier. You get warmed up on this run by hiking up the river side trail to the site of the old dam that formed Old Dayton reservoir. From here, you have just a few hundred yards before you get to the biggest rapid of the run, Timber Rattler. This rapid has a significant sieve on the left and a equally significant hole that you have to punch. 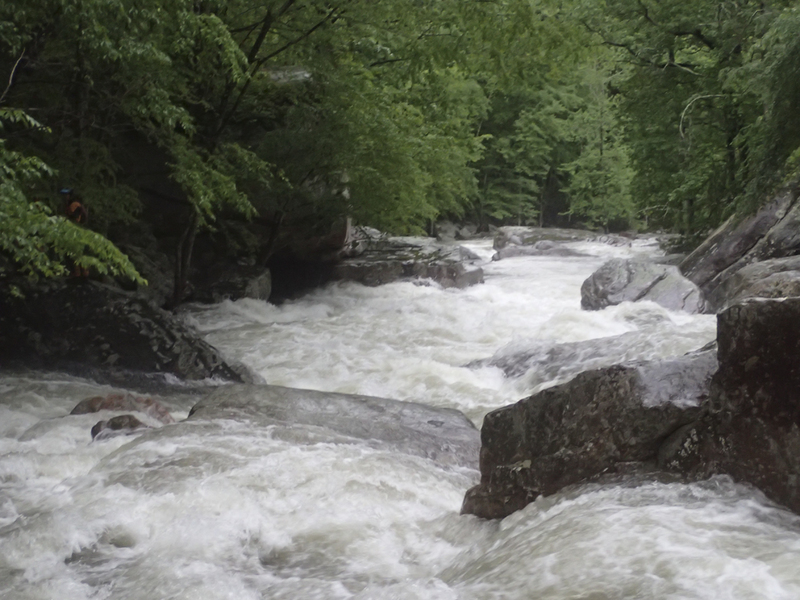 Below, the rapids come at you quickly before eventually easing up the gradient, though keep an eye out for the occasional bigger class IV drop or spicy hole to punch. 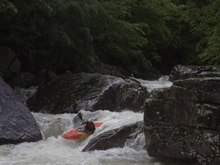 The final hurrah is Weirdo, which is a nice long rapid which eventually slides down into one of the bigger holes on the run. Aim far left and get the passing grade! This run is really good, especially high. Though at high flow the section went so fast I am not sure it would feel like a good hike to boat ratio. I could see making a nice weekend day here though, hiking up for a few laps. The hike is much shorter than Big Creek, and maybe only 20 minutes or so long I would estimate. Strange side note. 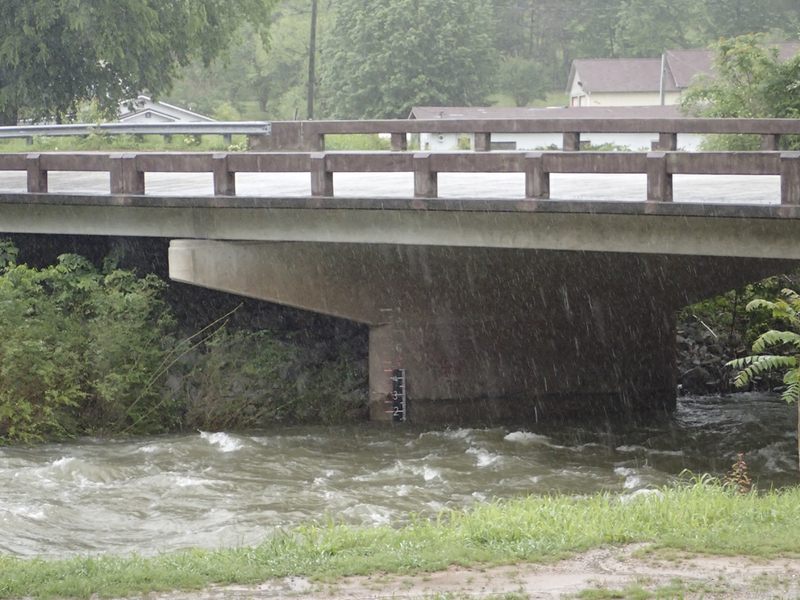 This river is actually 2/3rds on Henderson Creek. It doesn’t change names to Richland until Morgan Creek enters on the right between Harry Harry’s and Weirdo. For reference, we had ~2.25 inches of rain in the previous 24 hours. This run doesn’t require a whole lot to get going, typically just an inch or so. Mileage is: from Richland / from Henderson Creek. Old Dayton Reservoir (IV). The remnants of an old dam are run in the left channel. We went right of center. Below, is the start of Richland Creek which is commonly run by itself via a short hike. Timber-Rattler (IV+ to V). A couple different entrances are available, boof over the hole to the right or a sneak on the left, if you sneak mind the fold as you reenter the main flow. 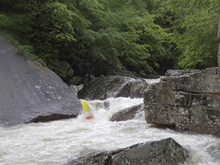 The main move is different at different flows, at low flow ferry from left to right below the fan rock to then line up the boof over the large hole at the bottom. At higher flows you can boof the left side of the fan rock. The bottom hole is worse at lower flows. Hole (IV). Just below we ran a ledge on the right that was super mean but went ok enough. If you got back-endered it would be bad though! Screaming Left Hand Turn AKA Left Down Hutt (IV to IV+). We did the lead in down a small channel on the right. 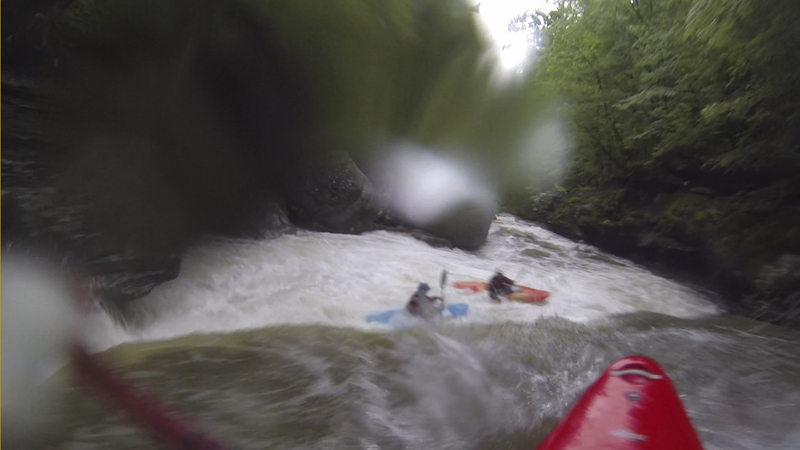 We then entered the main rapid middle and immediately worked right for a sweet boof over against the right wall. 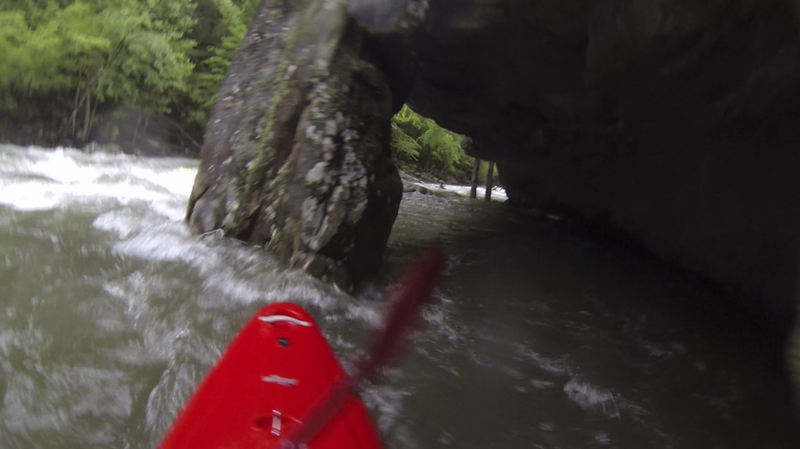 Error to the upstream side of the boof as the landing has some rocks in it. This then quickly leads to the “Harry Harry’s” which is a sweet 8 foot tall boof just left of the center as long as flows are over 0. If it is lower, run down the right. There is some really nice boogie in here. A few small slides though that doesn’t mean they don’t pack a punch with the holes that they form as flows come up. Somewhere in here there was a double drop over a mean holes that was fine as long as you got your bow up and boofed through the first one clean. Weirdo (IV to IV+). 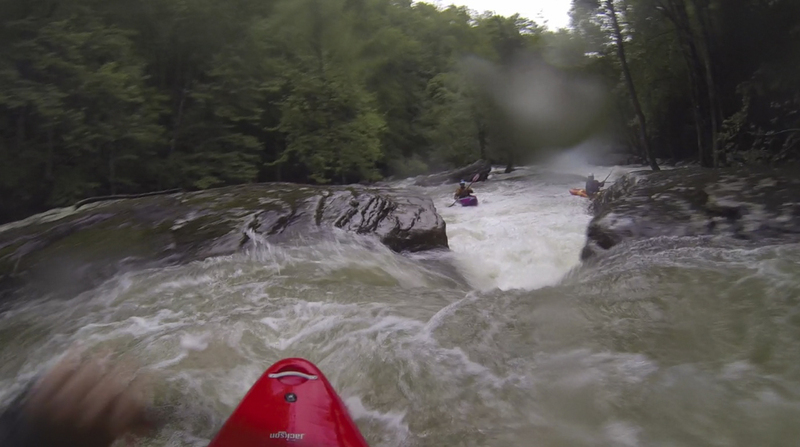 What a cool rapid. A long section of lead in boogie leads to the main drop. You want to hug the huge rock on the left and slide down into the fluffy hole below. 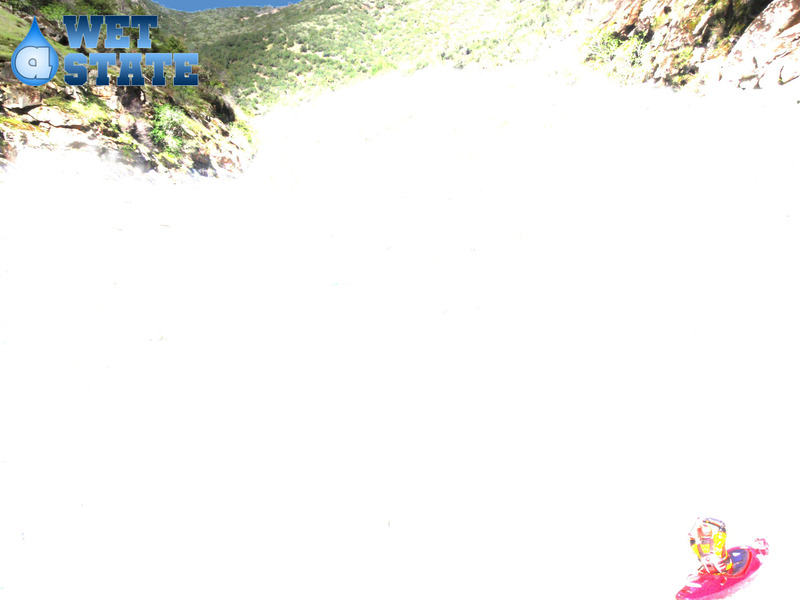 At high flows the hole is huge and as long as you are far left you will pop immediately out. I would hate to get into the meat of this hole for sure though. Take-out: From Highway 40, head south on Highway 27. As you enter the town of Dayton, take Walnut Grove Rd (just after the Walgreens). After 0.8 miles take the left onto Back Valley Rd. Continue for 0.7 miles before turning right to enter Pocket Wilderness Rd towards the Laurel Snow State Natural Area. This is a dirt road but was in good quality. Follow 0.9 miles to the end. Note, this area closes at 7 pm. 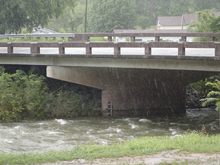 The gauge is back on Back Valley Rd, an additional 0.3 miles further at the bridge. Put-in: Hit the trail that leaves the parking lot. 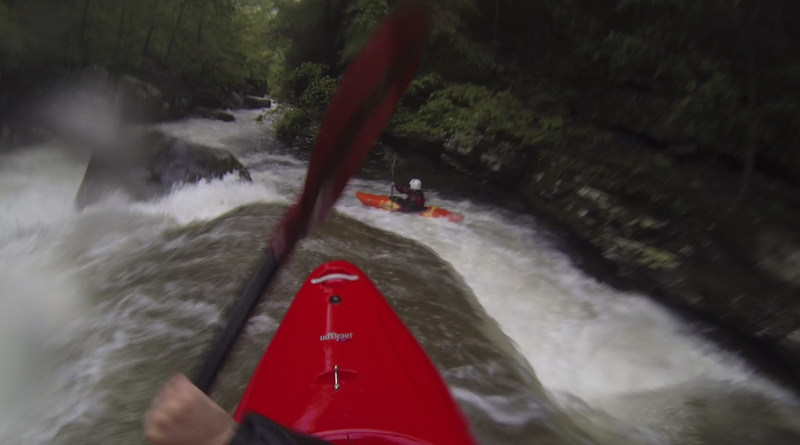 Heading up the river for each inch of downriver and gradient. Earning your turns!